Dimension >> 14×21 cm² ⁄ x+278 pages. Multithreading means doing many jobs atau threads at once. Time division is the key. In a program which doing many tasks, actually, those tasks aren’t always in active state, but only in wait state instead. In many simple program, waiting process is only used simply for wait. Usually done with a very long loop called delay. If program doing this while there is another unfinished task, then it is really a wasting time. The better techniqu is using sleep methode. When there is a task which in wait state, then this task will give its time to another task that need it. As a bonus for microcontroller lovers, this book also discussed a PS/2 keyboard, infra red remote controller, creating simple terminal for Linux, and so on. This book also discussed how to programm a microcontroller in effective and efficient way so it will yield in maximal result. Hal semacam itu bisa dianggap sebagai fitur saja. Untuk ATMEL AT89C5x atau AT89S5x tidak ada semacam BOD level, tetapi untuk Nuvoton N79E8x ada. 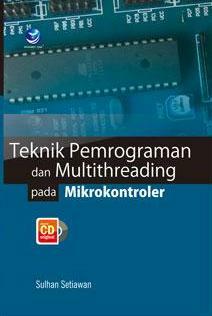 kang, di cd bawaan buku Teknik Pemrograman dan Multithreading pada Mikrokontroler, software Remote Controller signal viewer nya ga ada, minta dong?